Ally's Sweet and Savory Eats: Giada de Laurentiis Pasta Giveaway! Giada de Laurentiis Pasta Giveaway! I've been "unplugged" as they call it for the past couple of days, but wanted to "plug" back in quickly for a GIVEAWAY! If you are a watcher of the Food Network, or even The Today Show, you'll see lots of Giada de Laurentiis. She is known for her Italian cooking and simple, clean recipes. Giada has started her own cookware and food line at Target. 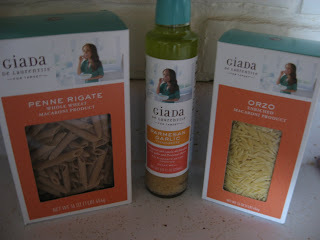 I love Target, as most women do, and now Giada has products there as well! Even better. The perfect ingredients to throw a pasta party! With a nice side salad, of course. Leave a comment telling me your favorite pasta dish. 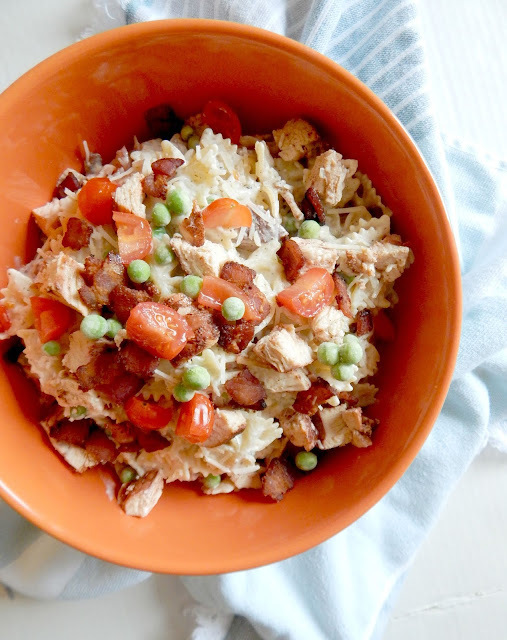 Become a follower of Sweet & Savory on your Google Reader. Become a follower of Sweet & Savory on Facebook. Post this giveaway on your blog, or spread the word on Facebook. Four chances to win! Each chance gives a separate entry. Contest ends at 7 a.m. on Monday, May 17th. The winner will be chosen randomly on Monday morning. fun! i love her cooking shows. and i love lasagna! My favorite pasta dish is actually a Giada recipe, it is a baked tortellini and it is amazing! I love butternut squash ravioli! I love my nonna's gnocchi. Carbonara is great too, when it's done right. my favorite pasta dish is cacio e pepe (cheese & pepper). it's a classic roman dish and it's really easy to make. no sauce required--the melted cheese + hot pasta water become a sauce. SO good. it's on my blog if you're interested. i'm a follower on fb now too! I love any type of pasta with an alfredo base sauce! So my family has been hosting a Swiss foreign exchange student this year and he is a phenomenal cook! He speaks French and for sure has that French flare for great cuisine. Gotta say my favorite pasta is his vegetable lasagna made with zucchini slices as faux noodles in addition to the regular pasta noodles and a Béchamel sauce in place of cottage/ricotta cheese! To.Die.For. I'm already a follower on reader & facebook. :) My favorite pasta dish is lasagna....especially the one at my favorite Italian restaurant: Firenze! Your blog is on my google reader! I like Sweet and Savory on Facebook now too! Any pasta in white sauce is my favorite! Great giveaway, thanks! I'm a fan of mushroom and cheese stuffed ravioli with vodka sauce :) and i'm following you on both and find your blog to be amazing! Ooh, I love Giada! My favorite pasta dish lately would have to be orzo with feta, spinach, tomatoes, balsamic, and whatever else I feel like throwing in! I love any type of ravioli... However, my favorite is a sweet potato ravioli with goat cheese cream sauce. SO GOOD! and now I'm a follwer on facebook! I love Giada! She came to Chicago a few weeks ago to do a book signing, but it was in the middle of the week and I had to work, so I couldn't go. I didn't even know about her food line at Target, how cool! I love baked ziti, and tortellini the best! Cheesey BAKED Ravioli with spinach and lots of Chheese. sliced onion and mushroom, Super yum. My favorite pasta dish is my mom's baked ziti! I love it, but can't make it b/c J can't tolerate ricotta. I already follow you on Google. My favorite Italian dish is Gnocchetti di Melanzane (Eggplant Gnocchi) :) *Thanks* for the giveaway! and I follow via google reader! I love Giada and how she pronouces everything! If you pick me youll save mucho on shipping, Ill even come pick it up in person :) Enjoy your weekend! I like Giada but sometimes her cleavage annoys me :) My favorite pasta dish is gnocchi...I NEED to learn to make it!! p.s. I follow your blog in Google Reader! We like Lasagne made with homemade sauce. We got the sauce recipe from an Italian friend of ours. It is so wonderful. My 2 year old grandson is so in love with Giada. He's loved watching her since he was a baby. He was calling out her name when we walked past her cookware display at Target. Oooh great giveaway! My fav pasta dish is pasta with red sauce, scallops and shrimp - YUM! Awesome giveaway! My favorite pasta dish is ... just about any pasta dish, really. But I love whole wheat pasta with shrimp and an arrabiata sauce. J'adore arrabiata sauce! Oh, and I'm a follower on Facebook now, too. My favorite pasta dish is actually a simple lemon, basil, parmesan recipe of Giada's that I found on the Food Network website. Its heavenly, and super easy. My favorite pasta dish is spinach ravioli... YUM! Mac and cheese, just love the stuff! I'm happy there are so many good whole wheat pastas out now, I don't feel so guilty when I eat it!! Very nice giveaway! One of my favorite pasta dishes is actually one of Giada's...Fusilli with Spinach and Asiago cheese. It's on the food network site. I love mixing pasta with garlic, mixed veggies, ginger and soy sauce. You're on my rss feed. Thanks for the chance to win! My favorite pasta is anything with marinara sauce and mushrooms - plain and simple! Sweet & Savory is part of my google reader! Following on Facebook (Julie Glissman). Great giveaway!! I love to do orzo with pounded lemon chicken and a sour cream sauce. Winner of Giada de Laurentiis Pasta Giveaway! BLTs, al fresco, burgers and more!